Approach: Follow the Ghost River driving directions for Devils Gap. 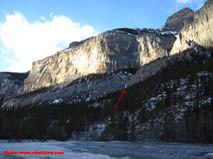 The climb is visible on the south facing cliffs a ways further up the valley. From the parking spot hike out to the creek and then up through the trees on the right side of the drainage below the climb. Takes about 40 minutes. click to enlarge… The view of the route from the parking area. Route Description: Climb one long pitch of often sun-bleached ice to the top. Descent: Rap the route with two ropes from the bolted station on the left. 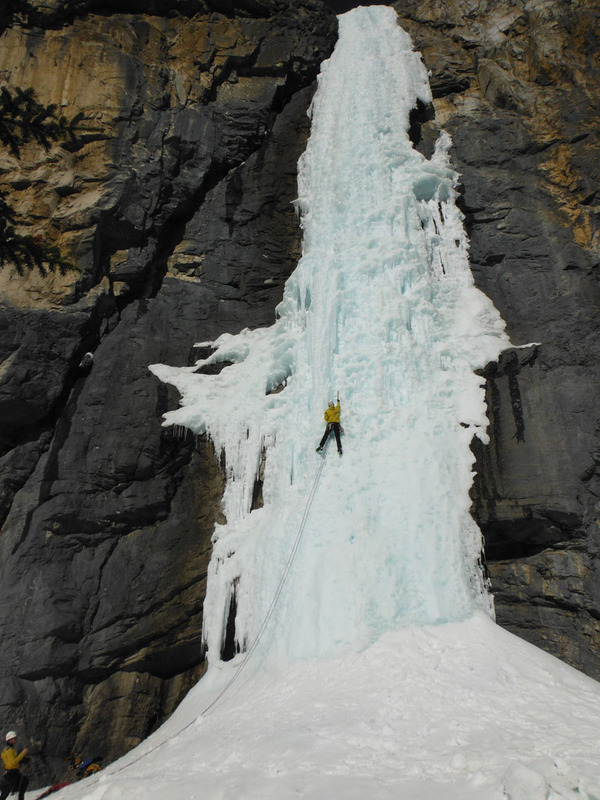 Objective Hazards: Owing to it’s sunny aspect, there may be some icefall and rockfall hazard at times. Rarely enough snow for any avalanche hazard.